Part of the Buddhist tradition, lokapala are the heavenly guardians of the four cardinal directions. Lokapala served as protectors from evil, and four figures would have been placed inside Chinese temples or tombs at the four cardinal points. Lokapala sculptures are typically made of stone, wood, or ceramic. Stone and wood examples are usually found in Buddhist temples. This pair of lokapalas is made of clay built over armatures with decorative shapes applied to the surface. These materials and the decorative glazing indicate the figures’ intended use in a tomb setting. Within the context of a tomb, lokapala are a type of mingqi or funerary sculpture. Early mingqi were either unglazed or decorated with simple green or brown glazes. 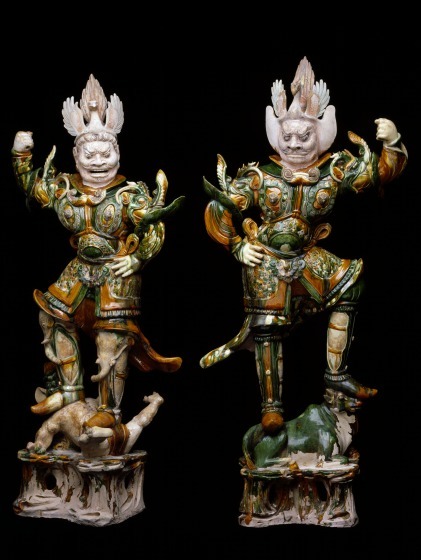 The sancai, or three color, technique used to create the colorful glaze of these two Tang figures flourished during the first half of the 8th century CE. This shift towards more dynamic decoration was accompanied by figures which were more elaborate in sculptural detail as well. "Pair of Lokapalas (Heavenly Guardians)," DMA Connect, 2012.